IT Industry: Whither Goeth It? PHOENIX, January 20 – Every so many years, computer industry gurus are asked to go search for a new Holy Grail. Usually that happens when the old guideposts outlive their usefulness, and the marketplace gets as confusing and foggy to the client CEOs as is the view of the world from the Foggy Bottom. Well, we seem to be upon that time again. “Quo vadis, IT industry?” (“IT industry: whither goeth it?" - in antique English), are the questions being asked by the CEOs today. And as the computer companies’ staffs scurry around to come up with answers, they inevitably turn to the computer industry gurus for help. We’ve just returned from an assembly of some of the industry’s finest minds. This “think tank” ended up generating more fog that it started with. To be sure, the conference lingo included plenty of new jargon, such as “adaptive enterprise,” or “business agility,” and even IBM’s “OnDemand” phrase (see “Different Strokes for Different Folks, But Same Old Storyline: "OnDemand" Is a New Name for an Old Concept,” Dec 2003). And it also used some new acronyms, such as UDC (Utility Data Center). But the discussion revealed that new terminology merely masked a dearth of new concepts and clear ideas about the new Holy Grail. So we decided we would attempt this latest Holy Grail quest, our 11th in 22 years, the way our most successful cerebral expeditions had been launched in the past– solo! So what and where is the new Holy Grail? As usual, it’s a combination of new and old. As a famous German poet and writer Johann Wolfgang Goethe said, "the great­est genius will never be much if he pretends to draw exclusively from his own resources. What is a genius but the faculty of seizing and turning to account everything that strikes us? Every one of my writings has been furnished by a thousand different persons, a thousand different things...."
The Old… (1) Back in early 1981, we predicted that IBM would enter the leasing business, and suggested that independent lessors would be doomed, unless they changed and adapted to a new, more competitive marketplace. (2) Back in 1985, we said that a transfer of value would be occurring – from hardware to software – and that some form of “metered software” may follow (such as charging based on EXCPs, an old mainframe term for input/output transactions). (3) Back in 1986, as the IBM midrange 4300 series premiered, we reiterated the above, and added that in the long run, this may lead to “free MIPS” – vendors giving away hardware so as to collect revenues from software and services. (4) Back in 1990, we said that stratification would occur that would place IT services companies at the top of the IT industry’s food chain (see “Industry Stratification,” Mar 1990). Nearly 14 years later, we all know that has occurred. We also said that the “best of breed” customers would morph into a new breed of IT services vendors - in conjunction and partnership with computer companies. That has not happened until now in any discernible way. (5) Back in 1993, we likened a successful growing corporation to an amoeba that knows when to split in order to continue to grow (see Annex Bulletin 93-17, 3/19/93, on EDS). Which says nothing about how good Gerstner & Co. will be in the art of architecting the new ‘new IBM’ - the main reason we applauded the choice of an outsider as IBM’s new CEO, in March 1993. Nor does it tell us much about how open-minded they will be to hire such missing talent from the outside, instead of protecting the turf on which they are comfortable - (re)engineering. Or if they’d be prepared to act as an amoeba, and split up when the size of an operation starts to get in the way (see Annex Bulletin 93-16, 3/18/93). (6) Back in 1994, we likened the PC and the Internet revolutions to the invention of a handgun. They empower the individual and small companies to compete with industrial giants on a level playing field. (7) We also said that, as a result, a re-fusion of arts and sciences would take place, returning man back to Leonardo da Vinci’s era. Emphasizing the same point at a meeting with senior IBM executives, we wondered if perhaps “IBM had too many engineers and not enough musicians” on its payroll? (see Annex Bulletin 96-42). (8) Back in 1996, we opined that circa 2010, corporations would no longer resemble the entities we know today – centrist, federalist entities created in the industrial era. We thought they’d be more like “loose confederations,” changing their shape and alliances all the time depending on the market opportunities. He (Bruce Herald) agreed with our notion that the most successful “companies” of that era may in fact be the loose confederations of businesses and individuals. “Many people don’t have a clue about what we are now talking about,” he added. “It’s the generation gap,” dividing the Fortune 500-type CEOs into two groups. Those who are in the 45 to 55 age bracket, generally understand the tectonic changes taking place in the world economies. But a 62-year old CEO doesn’t have a clue what this is about,” he opined. Well, the 55-year old CEOs from the time of the above conversation are now 63, and probably working on their putting game more than on corporate strategy. But are the new CEOs who replaced them any wiser, any more visionary and forward-looking, any more open-minded? Not necessarily. After all, who do you suppose picked the successor? And most people tend to pick the like-minded people, like Sam Palmisano in IBM’s case (see “Sam Is No Change Agent,” May 6, 2002). As a result, there was not much evidence of change in substance and strategy after two years of Palmisano’s leadership. Some gurus think that, "what we are seeing in big business is ‘strategy decay’." That’s what a highly esteemed corporate strategy consultant, Gary Hamel, said at a Boston conference four years ago. “Buying back your own stock is what people do who are bereft of ideas,” he added. “It’s usually done in companies run by a 60-year old CEO running his stock options to the bank. If you can’t grow, buy back shares,” (see “Death of The Corporation?”, July 1999). Strategy decay? Can’t grow? Buy back shares? Can you think of a three-letter corporate acronym that epitomizes all three Hamel epithets? Big Blue is actually a wonderful starting point in a quest for a new Holy Grail. For, it is both a provider and a consumer of change. So if one can figure out where IBM’s new Holy Grail is, the same “secret recipe” for growth and success should work for other corporate giants. [To see our recipe for Big Blue is, check out “Save, Spend and Split” (May 8), our five-year forecast]. All three terms referred to a process of creating building blocks that clients could use to design new corporate structures and functions. Andersen (now known as Accenture) also demonstrated another important ingredient for global success - creativity. The company started to use innovative “value based” arrangements with some of its clients. The services vendor’s compensation is linked to the value it helped create for the clients, not the standard “time and materials” fee structures. For the time being, this activity is still in its embryo, being tried only with select established accounts. About 20% to 25% of the deals have some value-based pricing elements in them, according to David Deal, Andersen’s manager for media and analyst relations. The New… What’s really new on the current Holy Grail trail? First, it is encouraging to see evidence of some Fortune 500 CEOs opening up their minds and wallets to real change, not just paying lip service to it. Twenty of Hewlett Packard’s top 100 customers, for example, have asked for “agility assessment” studies, said Ann Livermore, the head of HP Services and Enterprise Systems, at a recent conference in Palo Alto, CA. And “business agility” is a prelude to “adaptive enterprises,” she explained. The fact that one in five large company CEOs is now even contemplating such “radical” notions is nothing short of revolutionary. That’s especially true given what IBM’s Harreld noted about the Fortune 500 CEOs’ mindsets eight years ago. What’s the reason for such a dramatic change in eight years? Competitive pressures, and not just from their struggling peer-giants, but even more so from new competitors – the individuals and small companies that we talked back in 1994, about being empowered in the new IT era. So how goes it? How are they adapting? Not so great, it would appear, based on what we heard at the recent “think tank.” The concept sounds great in theory, but in practice companies are finding that the “devil is in the details.” In part, that’s because technologists with industrial era mindsets, not freethinking artists, are leading the transformation process. If the end result is to be a “dynamically changing, constantly evolving” enterprise, it will take both technology (to create tools) creative minds (to use them). The successful process, as we see it, is analogous to creating a painting or a sculpture. The IT services vendor brings to the table his toolkit and paints. The toolkit consists of various building blocks, along with instructions on how to use them. Just as software development, for example, evolved from writing individual lines of code, to using macros and icons and applets to speed up the creative process, so will the creation of new corporate forms – using the various IT building blocks. The IT services vendor also teaches the client how to use his tools and paints and brushes. Together with the client, he designs a kaleidoscope of shapes that the client CEO wants his “adaptive enterprise” to take, depending on the needs of the marketplace. So the search for the new Holy Grail – a key to creating successful “adaptive enterprises” - is a bipolar process. Like procreation, it takes a union of Ñ (chalice – woman - client) and a D (spade – man - vendor) to make it work. The chalice is the marketplace (customer), the spade is the IT provider (vendor). Back in 1990, we depicted the new world of IT vendors circa 2000 as a pyramid (or a blade, see the bottom chart – “Industry Stratification”). Back in 1996, we advocated that smaller is not only better, but also bigger, when it comes to market opportunity. And we depicted it as an inverted pyramid (or a chalice, see the top chart – “Market Opportunity”). Bruce Harreld, IBM’s chief strategist, said that more than 50% of the 1996 IT revenue opportunity lies in the small and medium companies market, which is growing at 14% to 15% per year, i.e., almost double the growth rates of the industry. “Technology is allowing these guys to compete with the big boys in their industries,” Harreld explained. 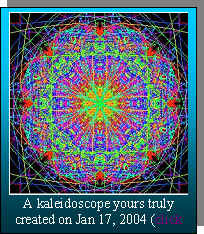 New Life… Now, putting the two charts and concepts together, the intertwined chalice and blade, woman and man, customer and vendor, symbolize the bipolar nature of creating a new life form – the “adaptive enterprise.” The two pyramids, tightly interwoven, symbolize the IT industry’s new Holy Grail (see the chart, keeping in mind that any similarity with the Star of David is coincidental). The symbol depicts the customer and the vendor as equal partners in procreation; the mother and the father of a new “adaptive enterprise,” their joint brainchild. From our vantage point, it is the only way corporate America may survive the onslaught of more nimble competitors, both domestic and from overseas. 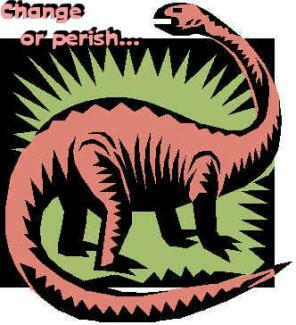 It is it’s the only hope for its resurrection and eventual rebirth as an “adaptive enterprise.” It’s either change and adapt by partnering with IT services companies, or go the way of dinosaurs… sooner or later. Change or perish - is a very powerful sales message that IT services vendors could be delivering to their customers’ CEOs, but aren’t, to the best of our knowledge. Or at least not forcefully enough. If they were, there ought to be 80 of 100 customers clamoring for “agility assessments,” not just 20. New Roles… The new IT industry’s Holy Grail obviously also requires some radical changes in the traditional roles and strategies of the IT services vendors. They must morph in their self-perceptions from being providers of specific non-essential tasks (such as running data centers), to being providers of life and fortune, like the owners of the thoroughbred studs who can sire the customer’s mares. (Of course, they’d better make sure first that they have thoroughbred studs in their stables, rather than parade ponies). In short, the IT services vendors are now the quintessential "change agents." New Metrics… New roles require new metrics, too, meaning new ways of measuring and charging for value created. No longer should the IT services vendors allow themselves to be on the mercy of the customers’ “overheads” or expense budgets; not when nothing less that the client’s survival is at stake. As equal partners in procreating and parenting the new “adaptive enterprises,” the IT services vendors have the right to demand and to expect commensurate shares of the revenues and profits that the corporate newborns generate. As you’ve seen before, that’s not a brand new idea. Some IT services vendors and we been talking about the “value-based pricing” and revenue sharing for at least eight years now. But the time has now come for theory to become a reality. All it takes is vision and courage. And what if a customer balks? That’s okay, too. Dinosaurs also failed to change. So the IT vendors may want to have their sales people leave a (duly authorized) copy of this article, along with their business cards. Maybe some CEOs will change their minds over time, as they get tired of swimming in alligators. New Terms… New roles and new metrics of the IT services providers also require new terms that describe them. “Outsourcing,” for example, should be abandoned as an outdated type of business relationship. Outsourcing implies that the customer turns over the responsibility for running its IT to a vendor, and then just yells at him if something goes wrong. As a parent of a new “adaptive enterprise,” the customer (mother) has a joint custody of the infant with the vendor (father). Both are responsible for its well-being. Both should share in risks and benefits of its upbringing. New Jobs… Finally, creating new “adaptive enterprises” takes creative people at the helms of enterprises. As far as we know, creativity has never been high on the list of prerequisites for a Fortune 500 CEO. Maybe it ought to be (we think so), but the reality is that it hasn’t been. So rather than wait for the corporate Boards to wake up and start replacing the complacent old-school CEOs with fresh new and creative blood, the Fortune 500 CEOs should be encouraged to take a proactive role and save their jobs – by creating a position of Chief Creative Officer (CCO), a corporate artist of sorts (even if the term sounds like an oxymoron). The CCO would play the role of the virtual mother in procreation of the “adaptive enterprise,” partnering with the corresponding number at the IT services company (the virtual father). The CCO should report directly to the CEO and have the power to cut through the bureaucratic webs that tie his corporation to the old legacy systems and habits. As we’ve also noted 10 years ago, the PC revolution and the Internet are returning man back to nature, paving the way for a re-fusion of arts and sciences. The new CCO position would embody that concept and extend it even to the corporate world. Foggy Bottom is the low-lying area of Washington, DC, where the State Department is located. Borrowing the terms from Dan Brown’s “Da Vinci Code” book. The Holy Grail term is used in this context metaphorically to describe the key to future survival and eventual rebirth of corporate America. 2003 IBM: "Small Is Now Big at Big Blue" (Oct 15); "A Passage to India" (July 22), “On the Nose But No Cigar” (July 16), “A Paler Shade of Blue” (June 2), “Save, Spend and Split” (May 8), “Shrunk by the Marketplace” (Apr 17), “Turnaround Continues...” (Apr 15), “Start of a Real Turnaround?” (Jan 17). (c) Copyright 2004 by Annex Research, Inc. All rights reserved.